Ion Darda and Marija Nesarobni grew up and married in Boian, Bucovina. Ion was a carpenter by trade and therefore built a big house for his family. Because he had the biggest house in the neighborhood, classes for the elementary grades were held there, too. With the school in Ion’s house, the teacher allowed Ion’s oldest son Nicolai to attend classes at the age of five. One of Nicolai’s tasks as a child was to lead the milk cow to pasture some distance from the village. One day the cow stepped on Nicolai’s small toe on his left foot, severing it completely. Like other Romanians from the village, the Dardas decided to emigrate to Canada. They sold what they could, packed their belongings and set off in 1900 with their four children, Nicolai, Vasile, Pachija (Pearl) and Mihai (Mike). When they were leaving, Ion’s father, Stephen, embraced Ion and handed him a hand- carved wooden cross and with tears in his eyes said to his son “Guard this cross all your life, keep your Orthodox faith, and may the good Lord help you in the New World”. Ion never forgot his father’s words. Along with the cross, Ion and Marifa brought other articles, among which were a 12-inch blade broad axe for hewing logs and a double-barrel shotgun. During the voyage on the ship a huge storm arose which tossed the ship hither and thither. The waves were mountain high and splashed unto the lower deck frightening the women and children. However, the ship sailed on safely and arrived at Halifax where it discharged its cargo. The immigrants boarded the train and set out for the western prairies. Finally arriving in the Boian area, Ion filed for a quarter of land N.W. 14-56-14-4. Once the family was settled, Ion went to work on the railroad track to earn money for the upkeep of his family. He had health problems all his life as his stomach constantly ached, and in 1916 at the age of 60, he passed away. 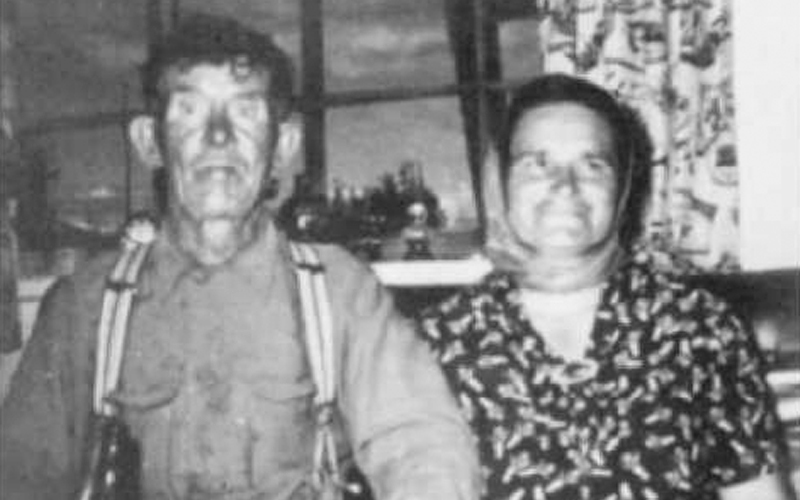 Marina, now a widow farmed with her son Mihai, moved twice, finally settling in the Deep Lake area, near the south bank of the North Saskatchewan River. Nicolai, the oldest of the children was born on Jan. 14, 1887 in Boian, Bukovina. At age 13, he accompanied his parents to Canada. A year later he went to work for a farmer named Johnson. Mrs. Johnson was a retired school teacher, so after evening chores were done, she taught Nicolai how to read, write and speak English very well. He had an excellent ear for music and learned to play the violin extremely well. In his adult years he accompanied Gregori Toma, who played the flute, at many weddings, parties and dances. Because he was a carpenter, he built many houses most of which are still standing today. When the C.P.R. railroad was built through Hairy Hill, Nicolai helped build much of the town, including the Co-op Store, Lumber yard, Railroad station, plus other build- ings. 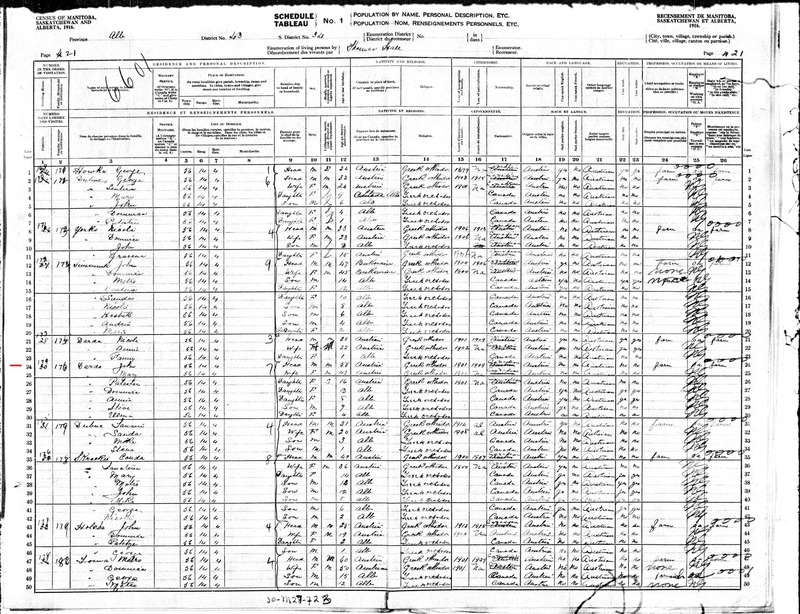 In 1911, Nicolai married An^ta Ravliuk and lived on their homestead S.E.22-56-14-4. Two daughters were born of this marriage, Dora and Mary. The mother died suddenly in 1917. Two years later Nicolai married Sanfira Semeniuk and their first daughter Vas- ilca (Mary Ann) was born in 1921. Until 1947 the Dardas lived at Boian where another nine children were born at home and sometimes Sanfira was her own midwife. Her husband, being a carpenter, was so often away. Only the two youngest, Peter and Roxcellia were born in a hospital. To earn much needed money, Sanfira would go stooking in the fall for the neighbors. She would put the baby in a wooden box and pull it from row to row. The baby loved the sun and fresh air so while it slept, mommy would stook as rapidly as possible. In 1947 the Dardas moved some four miles east in the Moose-Shalka area where Nicolai built a new house and where Sanfira still spends her summers. She raised cattle by herself until 1971, and although she is in her eighties, she still puts in a huge garden on the farm. For pastime, she knits mittens, scarves, slippers and blankets. She still loves to sing the Romanian songs she learned as a child and as a young mother. In all, the couple had four sons and eight daughters; namely: Mary Ann (Vasilca), Anne deceased, Kathleen, George a carpenter, Shirley, a medical diet cook at the Misercordia Hospital, Jenny, Rose, Helen (Eleana) a cosmetologist, Delmar a hair stylist and Peter who lives on the home place. Rocky who did all the research for both her paternal and maternal side of the family is married to Ron Chrapko and resides in Mundare. There are twenty-six grand children and seventeen great-grand children. Nicolai passed away on January 3, 1967. Vasile Darda was born in 1891 in Bukovina. When he came to Canada he went to work at an early age at Crow’s Nest Pass for several years. He sent most of his money to his father to help purchase foodstuffs and clothing so necessary in the New World. On his last working day he tried to hop a freight train in order to get home but fell and broke his leg. That put an end to his working away from home. He then filed on homestead N.E.22-56-13-4. In 1915 he married Gafitza Hustiuk. The couple had thirteen children but seven passed way as infants. The surviving ones are John, Mary, Sanda, George, Metro and Doris. Gafitza passed away at age 57. Vasile lived on the farm with his son George and family for several years. When older and weaker he moved to the Eagle-View Nursing Home in Two Hills where he died November 18, 1972. Pachi^a (Pearl) was born in 1899 in Bukovina and at age 1 she came to Canada. In 1917 she married John M. Mihalcheon. The couple lived on the homestead owned by John, N.E.-32-56-13-4. They had one son, George, and a daughter, Mary. In 1927 John passed away suddenly. In 1930 Pearl married Nick Myckaniuk and they had two daughters and one son. In 1970 they moved to Holden, where their daughter Anne lives. Pearl lives in her own house and works on ceramics. Domnica J. Darda was born in 1901 in Canada. She grew up on the homestead and married George W. Svekla in 1917. They settled on S.W. 15-56-13-4. Domnica, like the other Darda children, was very talented. Though she lived on the farm, she would take clay from the road banks and mold different objects. While still in middle years she became ill and passed away in 1944. Seven of her children passed away before their second birthdays. Surviving children are Sadie, Metro, Nicholas (now deceased), Lena, Anita, Rose and Amy. Ani|a J. Darda was born in 1907 in Boian, Alberta. 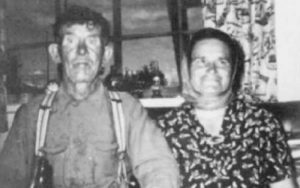 She grew up on the farm and in 1927 married John Huculak and lived on the family farm. The couple had four children, three sons, Metro who died in 1952, George and Johnny and one daughter, Doris. Anne passed away suddenly in 1960 and her husband followed in 1974. The farm is owned and operated by brothers George and John Huculak. Stephen Darda was the baby of the family. He attended Boian Marea School and then went on to Vegreville High School. He was a very talented artist. He painted locally all the stage curtains at Willingdon, Boian, Hairy Hill and Ispas community halls. He attended the University of Alberta hoping to become a medical doctor, but in 1940 while on holidays at home, he drowned while attempting to cross the North Saskatchewan River.